6.33 points at 12 votes (rank 561). The rather time-consuming fuelling process at the beginning of each life can unfortunately not be aborted. 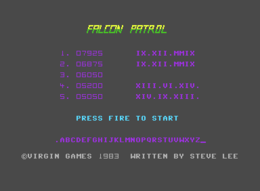 Falcon Patrol is a horizontal shooter with two-way scrolling by Virgin Games from 1983. 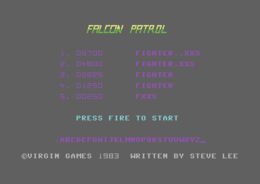 As last surviving pilot of the "Falcon Patrol" squadron, the player needs to fend off wave after wave of hostile jets with his highflier, to avoid the bombing of six airfields. These airfields are needed to refill the limited supply of ammunition and fuel in the short breaks between the attacks. A radar display in the lower middle of the screen shows the position of the hostile machines and the undamaged airfields that are left. All six waves the number of attackers rises one jet and breaks between the attacks get shorter. You start with three jets and get one life at 3.000 points. The first six waves are so easy, that it almost gets boring. The own and hostile jets consist of unicoloured high resolution sprites with only few animation frames, and they only differ by their colour. Similar to Defender, the landscape is scrolled into two directions, although it is very jittery, and repeats seamlessly after approx. six screens relatively fast due to the small sizes. That the happening obviously plays in a desert landscape, possibly in an oil production area as e.g. Middle East is sufficiently depicted by the yellow colour of the ground, some palm trees and oil tanks. Rectangularly running streets, edged buildings and unanimated trucks, that seem to be abandoned hurriedly appear less convincing. When shooting the fighter-bombers significant weaknesses in the collision query show, when the own missiles pass the enemy sprites without effect, which of course never happens vice versa. Additionally, a strong moment of inertia aggravates the controls, i.e. the own jet requires a few seconds to make a complete change of direction. Instantly after the start of the game, the both successful and pervasive rumbling of the jet engine attracts attention, which increases and decreases depending on the distance to the enemy and which is reached by the manipulation of the SID's filter register. Also the crashing noise of the own machine is aptly accompanied by a long-drawn howling of the damaged engine. Apart from that, the game has not much tonal noteworthy to offer - only exchangeable shooting sounds, hissing explosions, a shrill alarm if the fuel is short and sound effects when fuelling and a "standby" signal. Some heroic blares of trumpets make the all too short title tune and the highscore table has the luxury of accompanying the entering of each letter with seven different notes. This is exactly the reason why you should not let yourself get overtaken by the enemy while refueling. After six waves the number of hostile jets rises to three, after another six waves to four machines. The first jet of a wave gets you 25 points, the second 50, the third 100 and the last 200 points. Collisions with the enemy gets you no points. Destroyed airfields are only renewed after the loss of the current life. Unique extra life after 3.000 points (a short signal sounds). If you are afraid of changes, you need to know: the course of the game always stays clearly arranged. Hurry up and shoot the hostile machines because after some time they will veer off and be substituted by a new wave. Futhermore, the last plane of a wave is worth more points than all the previous ones together. Although it might be difficult: always trigger only short bursts and aim a bit top of the steering gear. Keep your distance from the enemy: if you follow them overzealously you often get a bomb dropped at you or you collide with the enemy. If possible, try to land after each attack and in any case lift of again before the enemy overtakes you on the airfield. At the beginning of an attack wave look at the radar and fly so that you move towards the enemy. Stop and shortly before the enemy machines enter the screen turn into their flying direction and start the chase. Watch the moving patterns of the hostile machines on the radar to avoid a collision. The version by Remember has a trainer version, additional bugfixes and a subsequently built-in highscore saver. Robotron2084: "I remember how I have pilgered to my buddy's in the summer '85 in the blazing heat for one hour, only because he had allegedly a totally new and great game, which then turned out to be Falcon Patrol. I was already not really enthused at that time by this rather simple and monotonous shooting around with jittery scrolling and bad collision query, but it was copied anyway. 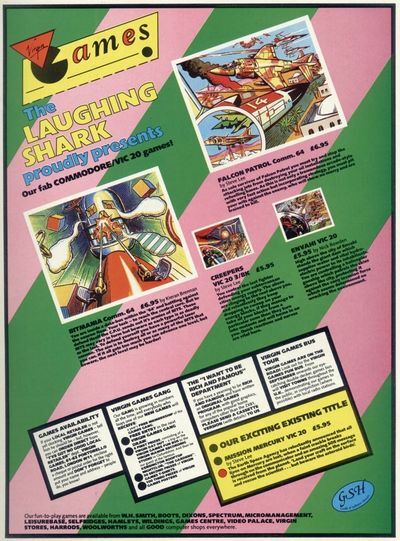 Of course on the schoolyard-game-swapping-market it was not worth a tinker's cuss, because at that time really everybody has owned it for months (except for me! )...and nobody seemed to like it much. 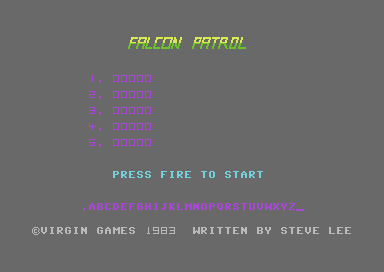 But that is no wonder, because technically is Falcon Patrol rather underexposed and concerning the content it is an absolute "One Trick Pony" - not even the colours of the enemies change and this would have been the least. The action is quite ok, however, the game quality cannot reach the one of the follower by far. 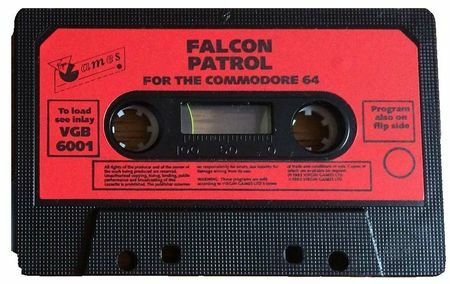 Falcon Patrol is and always will be for me what it always was: a classic.. no better: an oldie, that I only want to give me in small doses. 5 out of 10 points." 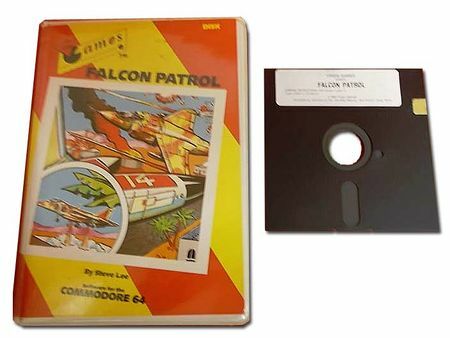 Shmendric: "As my previous speaker already said, really everybody had Falcon Patrol on some self-made game disk - which most of the time was prone to mildew. The rising difficulty in the course of the game provided for some motivation, the monotony of it takes it away again. I took it out only every half year at that time with the thought 'could play that again' for one or two parties, especially as the follower offers more appeal with the same game principle." Flodder: "Falcon Patrol is then as today a classic fill-in - always good foor a fast game and 10 minutes of pleasureable shooting around. But not more, too little diversification is offered. But alone the elaborately programmed soundscape is again and again worth hearing. That you could have made much more of the game is clearly proven by part 2. 5 out of 10 ! 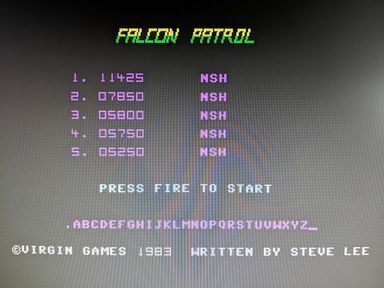 Added to the manual for Falcon Patrol was a fact sheet about the programmer of the game, in which amongst others you could read, that Steve Lee was intersted in bird watching and that he thought that the ability to go without food for a longer time was an advantage for programmers. 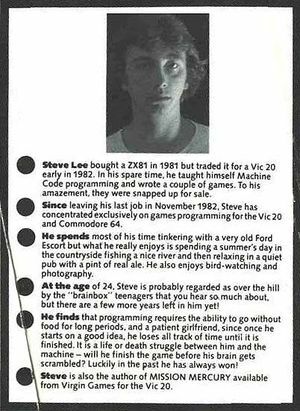 Some information about the programmer Steve Lee. 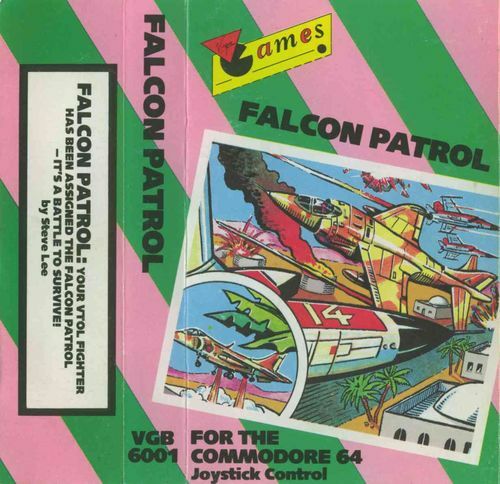 Combined advertisment for Falcon Patrol and "Bitmania". This page was last modified on 20 April 2019, at 18:20.